I just finished reading Rebecca Skloot's excellent book The Immortal Life of Henrietta Lacks. Lacks was a poor black tobacco farmer who was diagnosed with cervical cancer at the age of 30. Cells taken from her tumor were out to be the first human cells that could grow in the laboratory. Those "immortal" cells - coded named HeLa - would play an a crucial role in testing the first effective polio vaccine developed by Jonas Salk in the mid-1950s. Since then, HeLa cells have been used in thousands of studies, and added to our understanding of how both normal and cancel cells function. Skloot goes beyond discussing the science and bioethics surrounding the development of cell culture technology and human experimentation to provide a portrait of Henrietta as a person. And a big part of her story involves Skloot's decade-long interactions with Henrietta's family and friends, and in particular with Henrietta's daughter Deborah Lacks Pullum. She had always wanted to know who her mother was but no one ever talked about Henrietta. So when Deborah found out that this part of her mother was still alive she became desperate to understand what that meant: Did it hurt her mother when scientists injected her cells with viruses and toxins? Had scientists cloned her mother? And could those cells help scientists tell her about her mother, like what her favorite color was and if she liked to dance. Deborah began to teach herself about the basics of how cells work, and read everything she could about HeLa cells. But even when you have a solid background in biology, it can be hard to sort out what's solid science and what's speculation when scientific research is reported by the mainstream media. Even relatively mild headlines like "Cancer cells from long-dead woman invade other cultures" or "Human and plant cells combined" sound pretty sensational. "I saw [Jurassic Park] a bunch of times," she said. "They talking about the genes and taking them from cells to bring that dinosaur back to life and I'm like, Oh Lord, I got a paper on how they were doin that with my mother's cells too!" She held up another videocassette, this one a made-for-TV movie called The Clone. In it, an infertility doctor secretly harvest extra embryos from one of his patients and uses them to create a colony of clones of the woman's son, who died young in an accident. "That doctor took cells from that woman and made them into little boys look just liker her child," Deborah told me. "That poor woman didn't even know about all the clones until she saw one walk out of a store. I don't know what I'd do if I saw one of my mother's clones walking around somewhere." It's not that Deborah didn't know the movies were fiction, but that they seemed tell story similar to what she had been reading about her mother's cells. The science fiction seemed to help her imagine the foreign science. I don't find that surprising. An entertaining story can make science seem more "real" than a dry newspaper article or textbook filled with technical terminology. What I know about neutron stars comes more from reading Niven's "Neutron Star" than from any technical reading. It's sometimes said that we are living in "science fictional" times. Indeed we have the ability to manipulate the biology of plants, animals, and even humans in ways that were solely the realm of speculative fiction when the structure of DNA was discovered nearly 60 years ago. But the underlying science is complex, and the often poor reporting of current research rarely makes it much easier to understand. That's part of the reason why I find it so frustrating when science fiction movies and books get the basics wrong. We still can't clone dinosaurs a la Jurassic Park, and of course a big part of science fiction is pure speculation as to how science and technology might develop. But even wildly speculative biology should start with ordinary cells, DNA, and proteins in the same way that entirely fictional spaceships should obey the laws of physics. Science fiction - particularly in the movies - has the potential open the door to science to people with a wide range of educational backgrounds. I wish Hollywood would put more effort into getting the basics right. For more information about the writing of The Immortal Life of Henrietta Lacks, listen to the Radiolab interview with Rebecca Skloot that includes some of her recorded interviews with Henrietta's daughter Deborah. You can read an excerpt from The Immortal Life of Henrietta Lacks at Oprah.com. Image by Dr. Timothy Triche, National Cancer Institute. 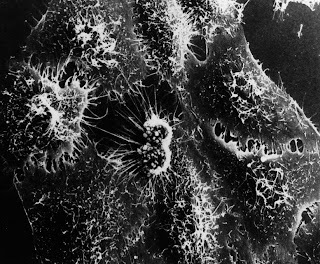 Scanning electron micrograph of cultured HeLa cells infected with Adenovirus. I myself did not know the story behind the HeLa cells though the term is quite familiar to biology/medical students. Thanks for sharing this info in your usual lucid and captivating manner. That's part of the reason why I found the book so interesting. It's so easy to forget that the cells began with a real-life woman. very nice piece. NPR ran an interview with Skoolt a week or so back (I'm sure it can be found on the site) and it was an absolutely fascinating interview. The taking of the cells was a bit controversial, but now, nearly two generations later - the life-saving attributable to them puts Henrietta - however unwittingly - up on the same pedestal as some of the greatest. Biological weapons are more lethal and deadly than the others.. I actually heard on NPR yesterday about Henrietta Lacks receiving a posthumous honorary doctorate in Public Service from Morgan State University. Her son was there to receive the degree on behalf of his late mother. Very interesting piece, enhanced even more by your fascinating article! i actually didn't hear about the story before. Thanks for sharing the information. The best Science Fiction I've ever seen is Kyle XY. It has always frustrated me that there are books like The Physics of Star Trek and most fans will argue about inconsistencies with warp drives and explosions in space, yet the same fiction that strives so hard to have a solid physics core fails miserably on basic biology. Things are slightly better with police procedurals but this has yet to penetrate into high science fiction or fantasy. I think that the recent discoveries of the DNA, will help to develop the cure for diferents health issues. There is a book , that ia m reading, named Genticks, it is full sci fi, but it shows how can be the future with this knowledge. I think this book is in Amazon.